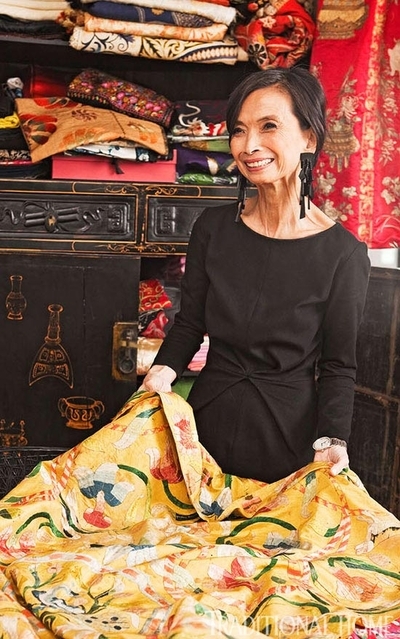 Josie Natori doesn't remember when she started collecting. Rather fittingly for a fashion designer, she simply says, "It's my shopaholic nature." And that goes back at least to her arrival in the United States from the Philippines at age 17, when she began prowling antiques stores in Greenwich Village. "That was when I learned to shop," she recalls, her eyes brightening at the thought. "I was still in school; it was new to me to look at old stuff." Now, she always shops when she travels, haunting flea markets and souks as well as dealers' shops everywhere. In Paris, she sometimes goes straight from the airport to the Marchés aux Puces flea market, because "the best things are there early in the day." But Natori buys not just to decorate her home or for the thrill of the hunt. Her textiles are the prime inspiration for the fashion business she started more than 35 years ago, after a career on Wall Street. She began buying "embroidered things" reminiscent of her grandmother's tablecloths. Her first products—nightgowns—resembled embroidered peasant blouses. Sitting behind a modern, curved black desk in her Madison Avenue corporate headquarters, Natori relates how drawing on Chinese and Japanese textiles early in her fashion career quickly became a hallmark, "a unique positioning for our clothing." At the time, in the '70s and early '80s, no one—not even Asian designers —had embraced traditional Asian designs. Japanese clothing was starkly modern, with the exception of Hanae Mori in couture. And the Chinese were still wearing Mao suits. Explaining further, the always elegant Natori—wearing a simple black jersey dress of her own design and black spiked heels with lizard trim—heads toward what she calls her archive, rather than her collection. "I've always had an appreciation for the past, especially things from the East," Natori says. Deciding that the Natori Company would reproduce "some version of a museum piece at an affordable price" gave her license to shop. Once, in Kyoto, Japan, in the late 1970s, she says, "I swooped up every kimono I could see in antique shops there. I must have bought 25 pieces—kimonos and obis—from the 19th and early 20th centuries. They became an inspiration for me in prints and design." Today, her archive contains specimens from Morocco, Turkey, Japan, China, India, Pakistan, England, France, Italy, Spain, Africa, Uzbekistan, Kazakhstan, Persia, and other countries—except those in North and South America. "It's all the old civilizations, where there was such care taken for intricate work," she says. What was made then in the Americas is not her aesthetic. "I do have a few things from Mexico, Ecuador, Central America by accident," she says, but she bought them mostly in Europe. Few of her textiles have provenance, and she can't even date them, except to say that they come mostly from the 18th, 19th and 20th centuries. "And don't ask me about weaving and that stuff," she commands. "For me, it's all about the design." When she buys something, it's because she has an "instant" visceral reaction to the shape, the colors, the figures, the design, the tassels—in other words, the visuals. "I don't care how old it is, really," she says. "If it pleases me, I buy it." What all of them generally have, she says, are "embellishments. I am attracted by exotic stuff." Natori pulls out a binder and points to a red Chinese silk with a Buddha theme. "That became an inspiration for pajamas," she says. "We relentlessly duplicated it, in different colored backgrounds—red, black, pink, beige. They sold for 10 years, and we're bringing it back again." She reaches for another, an 18th-century textile floral print from Lyon. "I turned this into a dynasty print pajama; it's 12 years old, and I can't kill it." The original ivory background became, in her designs, black, pink, and so on. Sometimes, she says, an embroidered design becomes a printed fabric, and sometimes vice versa. What is the size of this archive? Natori doesn't know. "It's a lot. I've had people here to help me with it." At her corporate headquarters, one room is lined with deep drawers marked with labels like Short Kimonos, Obis, Small Embroidery, Large Embroidery, Shawls, Western Florals, Asian Florals, and the like—all full. Larger pieces hang in nearby closets, each the size of a Manhattan kitchen, each jammed. More specimens rest in an Oriental cabinet in her working office. When Natori opens a door of it, out flops a toreador costume. Natori has one big worry about her collection. "I'm very proud of it, but on the other hand, I worry that I'm not taking care of it," she says. "Conserving and storing it has become a challenge." That's why she envisions a museum in her native country, where her archives would be an inspiration to many more people.